The trial of the Lucknow Metro Rail carried on 1st December 2016 flagged by Mr. Akhilesh Yadav, Chief Minister Uttar Pradesh between Transport Nagar depot and Charbagh railway station covering a distance of 8.5 km. The LMRC (Lucknow Metro Rail Corporation) Company is working on this project. The works began on September 27, 2014. It is another option of transport for local people. The continuous increasing population and private vehicles, autos, buses create heavy traffic and pollution is the major problem in the city. The Metro train will help in controlling pollution as well as heavy traffic as an option of inexpensive transport for local people. The two routes of the Lucknow metro are from North to South and East to West. The route of the North-South corridor is between Amausi airport and Munshi Pulia with a distance of 23 kilometres. It has 22 stations in which 19 stations are overhead and 3 stations are underground. The manufacturing cost of the North South corridor may be at Rs 74.13 billion. The name of the stations in the North South corridor – Airport terminal, Amausi, Transport nagar, Krishna nagar, Singaar Nagar, Alambagh, ISBT, Mawaiya, Durgapuri, Charbagh are in overhead. The Hussain Ganj, Sachivalaya, and Hazratganj are in underground stations. After Hazratganj station the route is elevated again and the sequence of the station – KD Singh Babu stadium, Lucknow University, IT College, Mahanagar, Badshahnagar, Lekhraj Market, Ramsagar Mishra nagar, Indira nagar and Munshi Pulia. 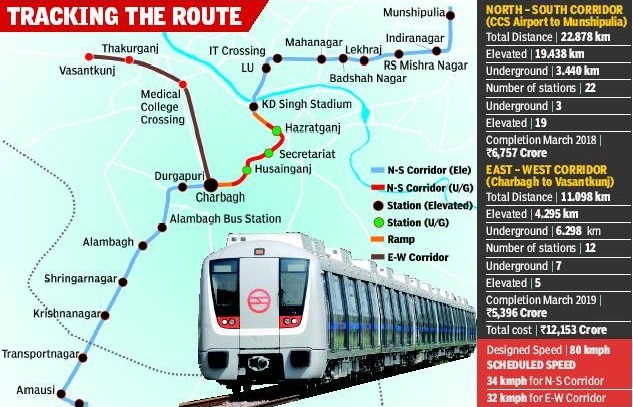 The second route is from Charbagh Railway Station to Vasant Kunj in the East-West corridor with a distance of 11km in which 4.29km elevated and 6.3km underground. This route has 12 stations in which seven underground and five overhead such as Charbagh, Gautam Buddha Marg, Aminabad, Pandeyganj, Chattrapati Shahuji Maharaj medical University (King George Medical University), and Niwazganj are underground stations and overhead stations are Thakurganj, Balaganj, Sarfarazganj, Moosabagh and the Vasant Kunj terminal stations. Both routes will interconnect at Charbagh. The manufacturing cost for this route may be at Rs 48.79 billion. In the Gomti Nagar side, the extension of route is between Indira nagar and Polytechnic crossing via Gomti nagar to Patrakarpuram. The Stations in this route are Indira Nagar Trisection, West End mall (Waves multiplex), Gomti Nagar and Patrakarpuram. The manufacturing cost for this route may be at Rs 4.95 billion. The arrival time of between two trains in every station may be 7 minutes and the future plan to decrease to 5 minutes and then to 3 minutes. The phase 1 may get ready in 2017. 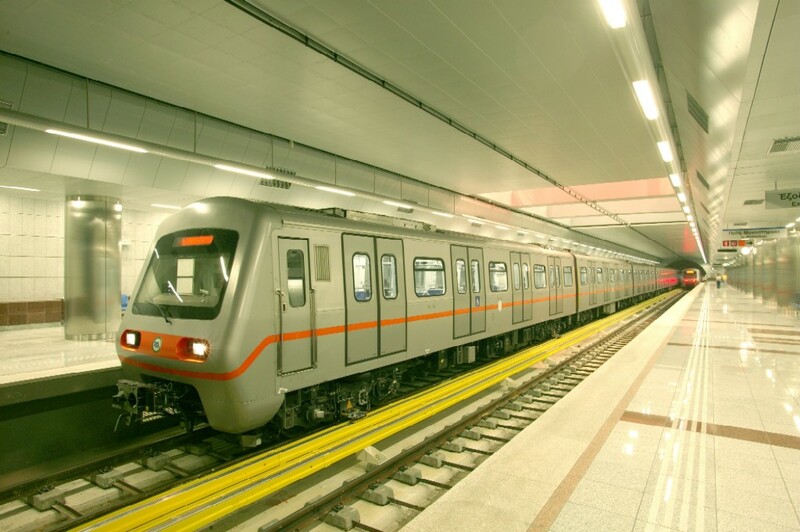 The speed limit of metro may be 90km/h (56mph). The speed limit for the North South corridor may be 34km/h (21mph) and 32km/h (20mph) for East-West route.